Gyrations in the U.S. gross domestic product obscure growth that’s steady, but still slow. 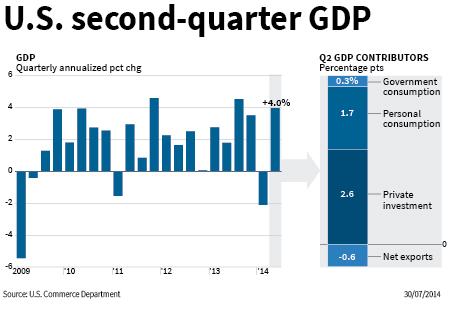 Output rebounded strongly in the second quarter, with a 4 percent annualized gain, after shrinking at a revised 2.1 percent rate in the first quarter, according to a report released on Wednesday by the Bureau of Economic Analysis. With 2011-13 expansion smoothed and pared to 2 percent on average, the underlying message – for everything from the economy to jobs and inflation – remains one of tame upward drift. The latest number was encouraging, though a renewed upswing in inventories accounted for a full 1.7 percentage points of the total gain. Strip out inventories and government spending for the first two quarters of 2014, and the private sector has grown at a mere 0.8 percent annual rate this year. Consumers have done their part, however. Real final sales of domestic product increased at a 2.3 percent annual rate in the second quarter, while the savings rate rose 0.4 percentage point to a relatively healthy 5.1 percent. Imports outpaced exports, though, dragging down growth and widening the gap in the balance of payments. The so-called personal consumption expenditure deflator, which the Federal Reserve watches closely as one indicator of inflation, ticked up at a 2.3 percent annual rate, above the central bank’s 2 percent target. That could be a sign of possible trouble ahead, and while prices have risen only modestly, it might prompt the Fed to accelerate any monetary tightening. The BEA also announced changes to past years’ data. It revised 2013 growth up 0.3 percentage point to 2.2 percent, but lowered the number for the previous two years, indicating a slightly weaker trend of economic expansion. The second-quarter report is only a first estimate, so it’s too soon to draw any firm conclusions. Last quarter’s first estimate was, after all, lowered a full 3 percentage points in the initial two revisions, then raised 0.8 point this month. Amidst all the noise, however, is a clear signal that the economy is ambling forward. U.S. real GDP rose at an annualized rate of 4 percent in the second quarter after a revised decrease at an annual rate of 2.1 percent in the first quarter, according to the first estimate from the Bureau of Economic Analysis released on July 30.